(CNN) -- Have you ever experienced itchiness or hives in your mouth area after eating raw fruit or vegetables? Do you also have seasonal allergies? People with allergies to birch pollen may have associated allergies to raw apples. If so, you may have oral allergy syndrome, whose symptoms occur because the proteins in some fruits and vegetables are similar to proteins in some pollens. "They're not identical proteins, but they're similar enough to confuse the immune system to have these reactions," said said Dr. Robert Wood, chief of pediatric allergy and immunology at Johns Hopkins Children's Center. That's not to say that everyone with pollen allergies has oral allergy syndrome. A person may sneeze all spring long and not have any obvious food sensitivities. Cooking the offending fruits and vegetables will "denature" or change the shapes of these proteins, so people with oral allergy syndrome will usually be able to eat them without a problem, said Dr. Stanley Fineman, allergist with the Atlanta Allergy and Asthma Clinic. Some people find that the peel of a fruit has more allergens than the meat, so peeling first helps, Wood said. 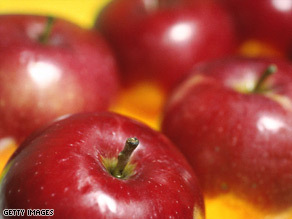 "Patients will typically decide on their own, without any discussion with a doctor, whether they enjoy the apple enough to put up with an itchy mouth, or whether they hate the itchy mouth enough to avoid the apple," he said. But in rare cases people with oral allergy syndrome experience anaphylaxis, a life-threatening reaction that may include blocked airways, low blood pressure, anxiety, vomiting and diarrhea. The most severe reactions require the use of an injection of epinephrine to subside, which is why many people with food allergies carry auto-injectors for emergencies. Over-the-counter antihistamines alleviate symptoms of reactions for some people, experts say. Studies have shown that some people who undergo allergy shots for pollen allergies will experience relief in oral allergy syndrome, Wood said, but at this point no one should get shots just for that reason, since they don't work on most people's food allergies. "If you are a good candidate for allergy shots otherwise, this may be a side benefit," he said. While other kinds of food allergies present in the first two or three years of life, pollen allergies that contribute to oral allergy syndrome develop more slowly, Wood said, peaking in the teenage and young adult years. Some people may develop allergies even later in life, he said. A person who moves to a new part of the country, having never been exposed to the native pollens there, may become allergic to those pollens and have some spill-over into food allergies, Wood said. Typically, once people start to react to some foods, they will also react to other foods in the same group. People may find that their allergies to raw fruits and vegetables subside during the season when the associated pollen levels are low. For example, a person may react to raw apples from March to October, but feel fine when eating them from November to February, when birch pollen is low, Wood said. About half of people with pollen allergies have improvement from puberty through adulthood, which correlates with associated food allergies, Wood said. "The better the pollen allergy gets, in most people, the less the food allergy will occur," he said.